Public sector banks are losing huge sums and running up gargantuan bad debts. Defaulters like Vijay Mallya, once politically powerful, are fleeing abroad. India’s banking crisis is fundamentally political, not financial. The left, predictably, blames wicked businessmen, saying the banking system has become a fiefdom of big business. Rubbish! The banks were indeed fiefdoms of big business before 1969. Then Indira Gandhi nationalized them to make them the fiefdoms of politicians. That’s the root of today’s crisis. Indira and her socialist acolytes claimed bank nationalization was essential for the state to capture the commanding heights of the economy, and channel bank lending to top social priorities. Actually, she could have ordered private banks to lend to favoured sectors (as is done today) without nationalization. Her real aim was to control all big finance, emasculating the businessmen and maharajas leading the Swatantra Party, the main opposition party after the 1967 election. She nullified the treaties Sardar Patel had signed with the princes to persuade them to accede to India in 1947. She abolished their privy purses and made them taxable, bankrupting them. She raised income-tax rates to 97.75%, added a wealth tax of 3.5%, nationalized several other industries, and made it clear to businessmen that dissenters would be crushed. The ploy succeeded. The Swatantra Party collapsed, and businessmen crawled. However, the poverty ratio did not fall at all after 1947 till 1983. Meanwhile, the population doubled, so the absolute number of poor doubled. That terrible human cost exposes the fraudulent intent and outcome of Indira’s Garibi Hatao policies, spearheaded by bank nationalization. Did nationalization spur lending to “the people”? As Orwell said, in socialism all are equal, but some are more equal than others. 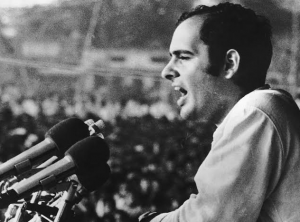 Most equal of all was Sanjay Gandhi, Indira’s son, who sought unending loans for his dud car project. Anyone opposing Sanjay — including R K Hazari, deputy RBI governor, and R K Talwar, chairman of the State Bank of India — got marching orders. After that, bank chiefs obediently followed orders (official or unofficial) from top politicians. That’s the genesis of today’s bank misgovernance and losses. The economy has grown 50 times since, so the misgovernance and losses have risen too. But in essence, Vijay Mallya is simply a new avatar of Sanjay Gandhi. After Talwar’s travails, pre-nationalization financial discipline was quickly destroyed. Loans were given to dud businesses and dud social projects (like loan melas to woo political vote banks). How many defaulters did nationalized banks remove from control of their businesses? Virtually none, since they had all bought political protection. Regional rural banks (RRBs) did indeed penetrate the countryside, a social plus. But they lost vast sums and had to be merged with the big banks. By the early 1980s, the bad loans of banks exceeded their equity capital. Technically, they were bankrupt. But given government ownership, that was not even news. After all, public sector behemoths had always lost huge sums, and been replenished indefinitely by the taxpayer. By the 1980s, nationalized banks were okaying highly inflated project costs that enabled promoters to skim off the excess. Banks “evergreened” bad loans (renewing them indefinitely) instead of admitting they were unpayable, taking over the assets of borrowers and auctioning them. Unpaid and unpayable dues were listed as “receivables”. And all receivables, believe it or not, were classified as “income”, even though nothing was coming in. Banking doyen Narayan Vaghul told me at the time that most bank profits were fictional, since they were based on receivables that were never received. On this fictional income the banks declared profits, and even paid corporate tax. And those that had no cash borrowed money to pay the taxes! That sad farce has continued ever since, in greater or lesser measure. Politicians have continued phoning bank managers. And at budget time finance ministers announce a host of schemes to be financed by the banks, a political diktat. Governments have the right to lay down lending priorities. But bank funds are actually the resources of citizen savers, not the government. So, politicians should not force banks to hold loan melas for vote banks, or go easy on favoured borrowers. Modi has brought in reforms aiming to provide more honest, independent bank chiefs and boards. This may improve matters. But the process is hardly foolproof, and can be reversed by a future government. Private sector banks (like ICICI Bank) have also been hit by bad loans in problem sectors like infrastructure and metals. But they avoided the worst loan proposals that nationalized banks happily accepted, with disastrous results. The private banks lent on commercial principles, not political orders. Probably bank privatization alone can ensure commercial discipline in future. But no political party wants that.